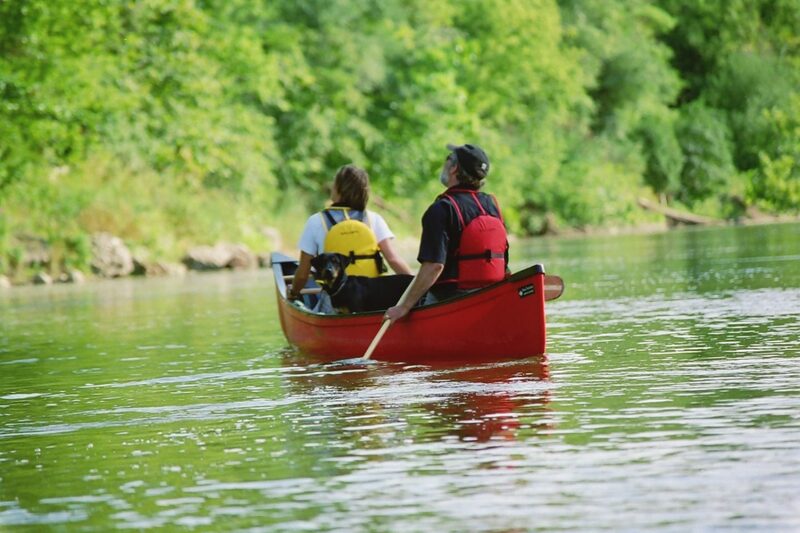 Guided paddling adventure on the Grand River. Authentic experience led by professional interpretive discovering the Canadian Heritage River’s rich cultural history & rare Carolinian forests. One of the best routes, Paris to Brant Park departs from private docks at our 145-year-old Outfitters shop in Paris Ontario. View unique riverside architecture as you paddle thru the heart of 1 of Canada’s prettiest Towns. As your guide tells the stories behind scenery a true Cultural experience on the river comes alive with their legends of Settlement & First Nations history. Leaving town you paddle into the Carolinian Forest, experiencing Canada’s most bio-diverse region with hundreds of species of fish, birds and plants, including 400 rare plants & animals. The Grand River here is a relaxing paddle with calm currents to move you along, plus dashes of small swifts to keep your interest piqued. All of our guides are Paddle Canada certified, many at instructor levels and can coach you on paddling skills. Along the route discover old abandoned gypsum mines at Mile Hill to learn about a miners life in early 1800’s Canadian Wilderness & how Paris got its name. Then taste the refreshing, natural cold Spring water flowing from the hillside to revitalize the river and you. Deepen the experience hiking into the Carolinian Forest on the Trail of the White Cedar. Find rare species like Shag Bark Hickory hiking to a scenic lookout over the valley. Your interpretative guide will introduce you to a world thought long past and help you picture the Native tribe that frequented those same paths 400 years ago. Paddle on to where the Grand meets a spring-fed creek, famous across North America for trout fishing and learn the Native legend of Whiteman’s Creek. Your guide will share many more authentic experiences along this unique adventure before arriving at Grand Experiences’ landing in Brant Conservation Area where we have scenic riverside campsites as we offer overnight adventure versions of this trip with camping or lodge accommodation. Our shuttle service transports you back to Paris, where you can finish your adventure with the Apr’s Paddle at one of Paris’ many establishments. Paris with its pubs, cafes & shops is the Apr’s Paddle capital of south Ontario.